As the 2016 spring chinook salmon and steelhead returns grow in numbers in the lower Columbia River, so have the numbers of sea lions observed at Bonneville Dam. The sea lions -- both Steller and California sea lions --gather at the base of the dam to feed on the fish. Still, according to the first pinniped status report of the year, the number of sea lions that are hanging out at the dam -- January to March this year -- to feed on the fish remains about average. The U.S. Army Corps of Engineers released March 21 its first status report of pinnipeds observed at the dam so far this year, along with the extent of their menu. The report, written by Patricia Madson and Bjorn van der Leeuw of the Corps, covers the period from January 1, 2016 to March 15. Steller sea lions, the local sea lion most commonly found along the Oregon and Washington coastlines and estuaries, have far outnumbered California sea lions so far this year, with the largest number of Steller sea lions observed March 9, when 34 were seen at the base of the dam. Some 11 California sea lions were observed on the same day. Counts of sea lions are taken daily, Monday through Friday, at powerhouse 1, spillway, powerhouse 2, and Tower Island. According to the Corps' report (www.nwd-wc.usace.army.mil/tmt/documents/fish/2016/160321_Bonneville_pinniped_update.pdf), the number of Steller sea lions dropped at the end of February, but March saw a rebound in numbers from about four per day to 25 per day. The Corps has documented 29 unique individual Steller sea lions in the tailrace of the dam through March 15. Some 26 of these had been observed in previous years and three were newly identified. The first California sea lion was observed on February 26 and their presence has been less than 5 per day. Eight individual sea lions have been observed and all eight have been observed in previous years. For the most part, the California sea lions have been small and younger, the report says, so have been difficult to identify because of their constant motion and swift movements. The states of Oregon, Washington and Idaho petitioned NOAA Fisheries on January 27, 2016 to continue removing California sea lions by lethal means. NOAA initially allowed the take in March 2012 of individually identified California sea lions at Bonneville Dam under section 120 of the Marine Mammal Protection Act. That authorization ends June 30, 2016. NOAA has opened a public comment period on the states' application through April 27. NOAA Fisheries "has determined that the application contains sufficient information to warrant convening a Pinniped-Fishery Interaction Task Force (Task Force), which will deliberate after the closing of a public comment period. 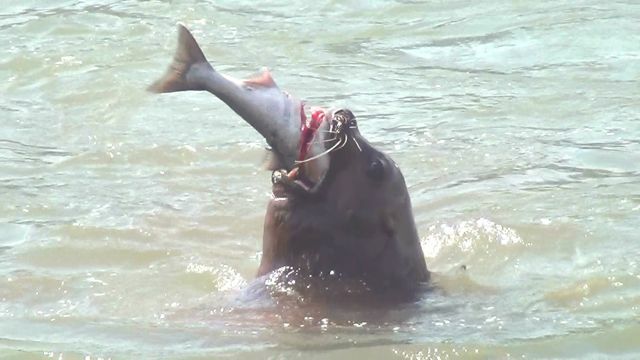 NMFS is soliciting comments on the States' application and other relevant information related to pinniped predation on salmonids at Bonneville Dam." Sea lions have favored steelhead, which the report says has been the most targeted fish species, primarily in the powerhouse 2 tailrace. Some 20 steelhead were eaten by Steller sea lions, while California sea lions took just one between January 1 and March 15. Chinook salmon catches by sea lions have been low so far this year, the report said. Steller sea lions have taken 11 chinook, while California sea lions have not taken any. Predation by sea lions of adult chinook salmon and steelhead has been similar to previous seasons, while white sturgeon predation has dropped considerably from the ten-year average consumption, yet similar to the last two years, January 1 through March 15. As was the case last year, observers are seeing less predation on sturgeon than the ten-year average. Just nine cases of sea lions taking sturgeon have occurred so far this year, with the most occurring in the powerhouse 2 tailrace, followed closely by the spillway and then powerhouse 1. All were taken by Steller sea lions. Most of the sturgeon were in the 2-foot to 4-foot range, with the largest in the 5- to 6-foot range. Eight unidentified fish were taken by Steller sea lions and one by California sea lions, while one smolt was taken by a Steller sea lion. Overall, 49 fish were taken by Steller sea lions and just 2 by California sea lions over the report's timeframe. Last year, predation of salmon and steelhead by the sea lions was the highest on record. In total, pinnipeds ate 8,474 salmonids, January 1 through May 31, a number that far exceeds the 10-year average of 3,515 fish. California sea lions consumed the most in 2015, eating 6,574 spring chinook and 47 steelhead. Steller sea lions consumed 1,720 chinook and 133 steelhead. Both are expanded numbers, which are estimates that take into account the times when sea lions were not being observed (weekends and nights). The Corps has yet to provide expanded estimates for 2016. Pinnipeds in 2015 were also observed to take 34 white sturgeon (favored more by Steller than California sea lions), compared with the 2006-2014 average of 1,285 sturgeon. In addition, sea lions took 107 Pacific lamprey, 38 American shad and 539 other or unknown species. As in previous years, to discourage sea lion presence and predation, the Columbia River Inter-Tribal Fish Commission began boat-based hazing March 7. CRITFC plans to haze Mondays, Thursdays, and Fridays. Dam-based hazing by the U.S. Department of Agriculture began March 8. USDA will be hazing seven days a week in 8-hour shifts. "Thus far hazing has been effective toward the Stellers that appear a little more skittish and the new-to-Bonneville animals," the report says. "They are currently hazing pinnipeds off of Tower Island during the day in an attempt to keep animals from habituating to Bonneville Dam. However, Stellers continue to haul out and sleep on Tower Island when the hazers are not present." The Corps has taken an extra step this year to prevent sea lions from climbing over floating gates at powerhouses 1 and 2. Wood panels have been placed on top of the floating gates to prevent the animals from entering the fishway. Called sea lion exclusion devices, they were installed at powerhouse 2 on October 26, 2015 and at powerhouse 1 on March 1, 2016. Even with the extra tall gates, a Steller sea lion was seen in the Washington shore fishway on March 14. The north shore fishway entrance sea lion exclusion device was lifted and an attempt to haze the sea lion out of the collection channel on March 15 ended with unclear results, the report said. A California sea lion branded U625 was first observed in the forebay on May 18, 2015 and was successfully removed on January 28, 2016. A California sea lion was observed in the forebay on March 8. It is not branded and appears to be new to the forebay. A small Steller sea lion was observed by operators entering the navigation lock on March 8. The downstream gates were opened and the Steller swam back downriver.